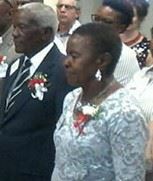 Pictured: Frans Aupa Indongo and his common law wife Beata._Photo: Internet. THE Okahao Lutheran parish in the Okahao constituency of the Omusati Region, is this Saturday morning the scene of a high profile wedding ceremony. 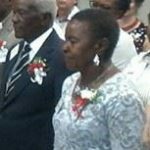 The bridegroom is none other than the 83-year-old business personality Frans Aupa Indongo. He was in a jovial mood when Informanté contacted him Friday afternoon. Indongo and his common law wife, Beata, are seeking the blessing of the Roman Catholic Church a year after the death of his estranged wife Kordura GwaMbeno. The new marriage was impossible while his estranged wife was still alive. The Catholic Church where their marriage was contracted permits no divorce. According to the Catechism of the Catholic Church, a separation of spouses “while maintaining the marriage bond” can be legitimate in certain cases and “civil divorce” can be tolerated if it does not constitute “moral offense” and is done to ensure certain legal rights and the care of the children or the protection of inheritance, but according to Catholic teaching, sacramental marriage can only be dissolved by the death of one of the spouses.